In stock -This product will ship today if ordered within the next 30 minutes. 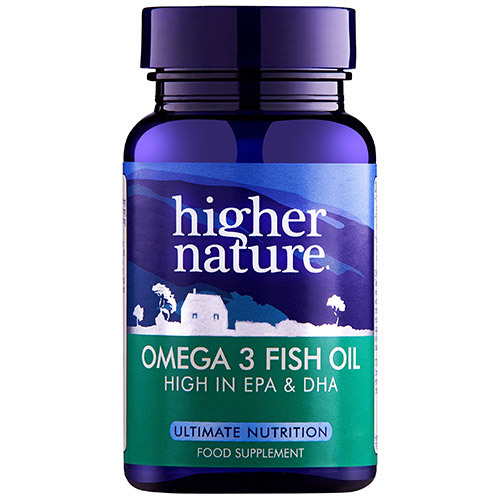 Higher Nature Fish Oil - Omega 3 is a premium quality omega 3 fish oil that provides a good ratio of the omega 3 fatty acids EPA and DHA. These fatty acids are crucial for the support and maintenance of proper hormonal, metabolic and neural function. Our modern diets provide up to 20 times more omega 6 than omega 3, more than at any time in human history. But omega 3 is vital for the support of proper brain function, healthy skin and many bodily functions. This premium fish oil provides a good ratio of the omega 3 fatty acids EPA and DHA. EPA and DHA are the key omega 3 fatty acids, important for supporting and maintaining a healthy heart and arteries, the brain and for flexible joints. This premium quality fish oil is scrupulously screened for PCBs and other pollutants to ensure the highest standard possible. You will not find a purer fish oil. Omega 3 fish oil (antioxidant: natural mixed tocopherals); capsule shell: gelatine (bovine source), glycerine; antioxidant: dl-alpha tocopherol (Vitamin E). Take 1 - 3 capsules (children over 8 years 1 capsule) per day taken with meals, or as your health professional advises. A daily multivitamin is also recommended. Below are reviews of Fish Oil - Omega 3 - 180 x 1000mg Capsules by bodykind customers. If you have tried this product we'd love to hear what you think so please leave a review. This is an excellent quality product, will buy again. Excellent quality product, great price and easy to swallow. Good value for money! Best fish oil capsules! This is a good fish oil, the price is good the capsules are a good size to take and there is no fishy aftertaste in my experience. I am still using this product because I like its taste and the size of the capsules. The best fish oil capsules that I have found. The capsules are just the right size. Question about Fish Oil - Omega 3 - 180 x 1000mg Capsules Is the oil from wild or farmed fish? Our fish oils are sourced from fish caught in the atlantic and are not from farmed fish. All our oils are independantly screened for pollutants and toxins to comply with present EU regulations. Question about Fish Oil - Omega 3 - 180 x 1000mg Capsules Are there any omega 3 products available for vegetarians in capsules? A good vegetarian source of Omega 3 is a flax seed based product such as Udo's Choice Ultimate Oil blend. However, this is a liquid oil rather than a capsule based product. Click here for more details of all our Flax Seed oil products that are suitable for vegetarians. 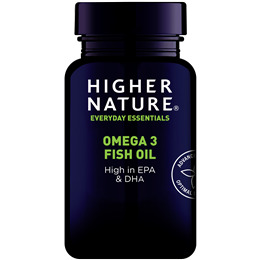 Higher Nature Fish Oil - Omega 3 is a premium quality omega 3 fish oil that provides a good ratio of the omega 3 fatty acids EPA and DHA. Crucial for the support and maintenance of proper hormonal, metabolic and neural function.